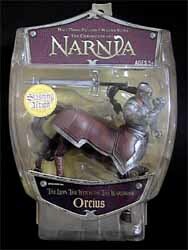 Released well in advance of the movie's 08 December 2005 theatrical release, The Chronicles of Narnia: The Lion, the Witch and the Wardrobe toys from Disney should be snapped up now before they become this Christmas's must own, and hard to find, toys. The Oreius action figure is incredibly well detailed. This centeur warrior comes equipped with armour and a removable sword. The paint job is pretty impressive - making the figure look like he's been in battle. His armour is skuffed in places and his sword appears dirty. This makes these toys appear more lifelike - and certainly something that serious collector's will appreciate. 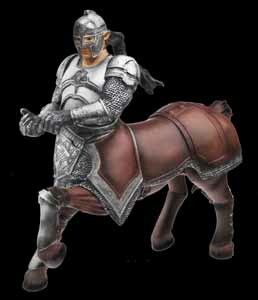 Twisting the torso gives this figure a broadsword slahing action, and pulling it back, with it's rear legs pushed down, allows it to appear as though it is rearing up. Whether or not the movie is a box office success or failure, one thing is certain, fans of the movie couldn't wish for a better quality range of toy merchandise.